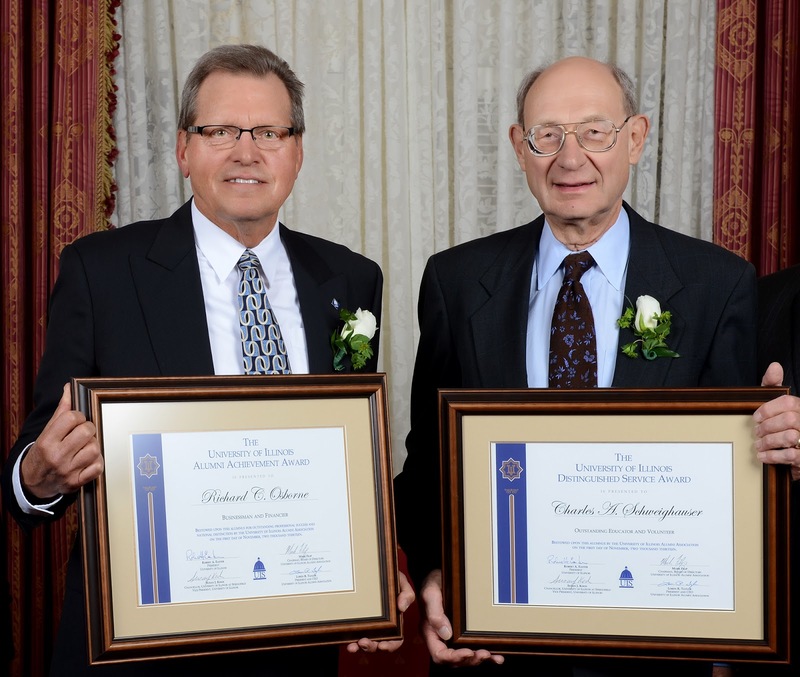 The University of Illinois Alumni Association honored Richard Osborne and Charles Schweighauser during the University of Illinois Springfield Alumni Gala on Friday, November 1, 2013. Over 250 people attended the event at the Illinois Executive Mansion in Springfield. The Alumni Achievement Award was presented to Richard Osborne, who earned a master’s degree from the UIS College of Business and management in 1973. He is currently senior managing director of Madison Capital Partners. The award is the highest honor bestowed upon graduates of the University. It is given to those who have attained distinction and success in one’s profession or life work. Osborne is living proof of the steps he believes it takes to succeed: get an education, work hard and concentrate on results. He began his corporate career at The Pillsbury Company, and began working in the Springfield, Ill. operation in 1969. It was during this time which Osborne completed his master’s degree in business admiration at UIS (then Sangamon State University). He joined Scotsman Industries in 1979, and rose through the ranks to assume the position of CEO, Chairman and President of Scotsman Industries, Inc. During the 10 years Osborne held the position, he was responsible for the direction and operating performance of the NYSE listed, international manufacturer. Company sales went from $150 million to $750 million, achieved through vision, strategic management and sound business practices. By 1999, when Osborne led the sale of the company, Scotsman Industries was operating 22 plants in 6 countries. Both Scotsman and Osborne have been cited and highly ranked in Crain’s Chicago Business and recognized as a Business Leader for the Chicago Region. The Distinguished Service Award was presented to Charles Schweighauser, professor emeritus of English, Astronomy/Physics, and Environmental Studies at the University of Illinois Springfield. The award is presented to individuals who have demonstrated exceptional commitment and service to the University. A founding faculty member of then Sangamon State University, Schweighauser’s remarkable career and wide ranging interests greatly influenced the development of the Astronomy/ Physics, Environmental Studies and English departments. Professor Schweighauser’s life of service to the University has captivated thousands of children and adults alike. He’s inspired those who have sat in his classroom and his community lectures about astronomy and physics. He also helped establish the UIS and Barber Research Observatories and “star parties”, which have educated many community members and school-aged children. His strong desire to share the universe led to his development of a telescope with a fixed eyepiece – a fixture which allows persons with disabilities to view the wonders of space - an accomplishment which is credited to be one of the first of its kind in the world. Though he officially retired from the University in 2002 as professor emeritus of Astronomy and Physics, English, and Environment Studies, Professor Schweighauser has actively taught and mentored for several years following. For more information on the awards, contact Chuck Schrage, vice president and association chancellor for alumni relations at 217/206-7395 or email cschr1@uis.edu.